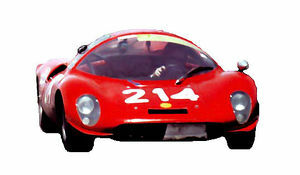 1968 De Sanctis Fitted with a 1 liter Ford engine , at the Targa Florio in 1968 and 1969. 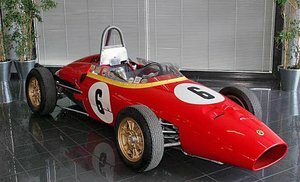 Although better known for their single seaters, including Formula 3, De Sanctis also produced some 'road' cars, really meant for sportscar racing. 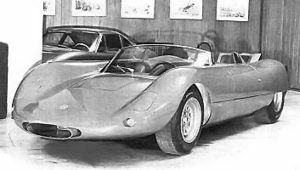 One such car was presented at the Turin Motorshow in 1966 and had a mid-mounted engine with a choice of capacities, from 1000, 1600 or 2000cc. The Colotti transmission could be fitted with five or six ratios. Tubular chassis. Step 200cm. Front track 122cm. Rear track 118cm. Front suspension with inferior oscillating trapeze, advanced cross-sectional crossbow, telescopic shocks-absorber. Rear suspension with inferior oscillating trapeze, oscillating axle shafts, advanced cross-sectional crossbow, longitudinal struts of reaction, telescopic shocks-absorber. Motor Rear Fiat 600. Bore 60,4mm, run 65mm. Piston displacement 746 cm3. Power 50 CV to 6.000 turns/min. Feeding with a carburetor double Weber body invert. Change of derivation Fiat 600, to 4 marce + RM. Drum brakes on the four wheels. Front tires 5,20x12. Rear 5,20x14. Tubular chassis. Step 200cm. Front track 122cm. Rear track 118cm. Front suspension to inferior and advanced oscillating trapezes, telescopic shocks-absorber and coaxial cylindrical motivatings force. Rear suspension to inferior oscillating trapeze, oscillating axle shafts, advanced cross-sectional crossbow, longitudinal struts of reaction, telescopic shocks-absorber. Motor Rear Fiat 1,100/103. Bore 68mm, run 75mm. Piston displacement 1,098 cm3. Power 72 - 83 CV to 6.200 - 6,500 turns/min. Feeding with two horizontal carburetors double Weber body. Change of derivation Fiat 600, to 4 marce + RM. Drum brakes on the four wheels. Front tires 5,20x12. Rear 5,20x14.